Bottom Line: Vaja has long been known as a leading manufacturer of top-notch cases that are both aesthetically appealing and conveniently functional. The Vaja iPod shuffle case is no exception. In the music player industry, product cases are an often overlooked market. First party manufacturers see it only as another way to squeeze out some extra cash from a customer, and many times style and quality are overlooked in favor of a low price and faster production potential. Yet, there are a few companies such as Vaja who have taken it upon themselves to bring high quality products to this small market. Today, we will be taking a look at Vaja's latest addition to their luxury MP3 product protection line: The iPod shuffle case. As with all of Vaja's leather products, their classic leather styled iPod shuffle case came packaged in their signature black designer box. Aside from inserts advertising other Vaja products, there is a Vaja product card as well as the other usual Vaja items, like a booklet with tips on how to take care of the leather product. Then, there is the case itself. This case is easily one of the most stylish options for iPod Shuffle owners looking to get some extra protection for their music player. 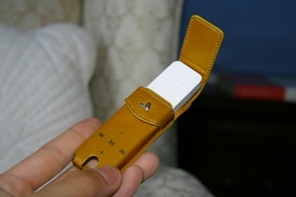 The cracked, "classic," styled leather is as easy on the eyes as it is to fit your shuffle into. 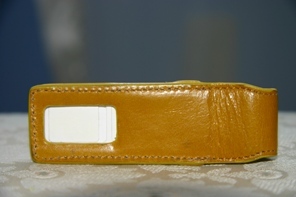 Slipping the shuffle into it is just a matter of flipping open the leather flap and sliding the player into the case. Operation is unproblematic for the most part. There are black etched markings indicating the various buttons, as well as a cut-out in the back for the off/playlist/shuffle slider and an opening for your earphones. The only problem I had with operation was the volume down control; the leather locking flap extends down too much and sometimes interferes with the button. It is not an issue that would drastically decrease functionality, but its annoying when you have to slide the flap up before you can gain full access to the button. 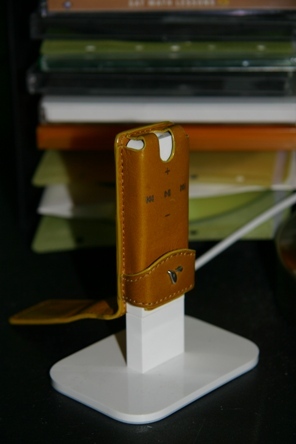 Also, unlike other iPod shuffle cases, Vaja's case allows you to sync your player without having to remove the case. Simply remove the flap before inserting the shuffle into a dock or usb port and replace it after syncing. Vaja has long been known as a leading manufacturer of top-notch cases that are both aesthetically appealing and conveniently functional. The Vaja iPod shuffle case is no exception.